While making advancements in power and performance with their test car, Alpha started mapping out the new Alpha 16 package for the GTR. With the success of the Omega program came the demand for a package that would be capable of beating ANY car on the road. The Alpha 16 was born-delivering the characteristics of a street car, with the ability to completely trump anything on the road or track. One of the key factors to the enormous power of the Alpha 16 is the AMS Turbo System, which provides 1800hp, yet still provides a usable powerband. Typically power at this high of a level comes at a huge cost-drivability and a narrow powerband. However, Alpha has tuned ever aspect of their Alpha 12 Package to allow for a true Dr.Jekyll/Mr.Hyde setup. Calm, docile driving around town, with explosive neck-snapping power at your command. 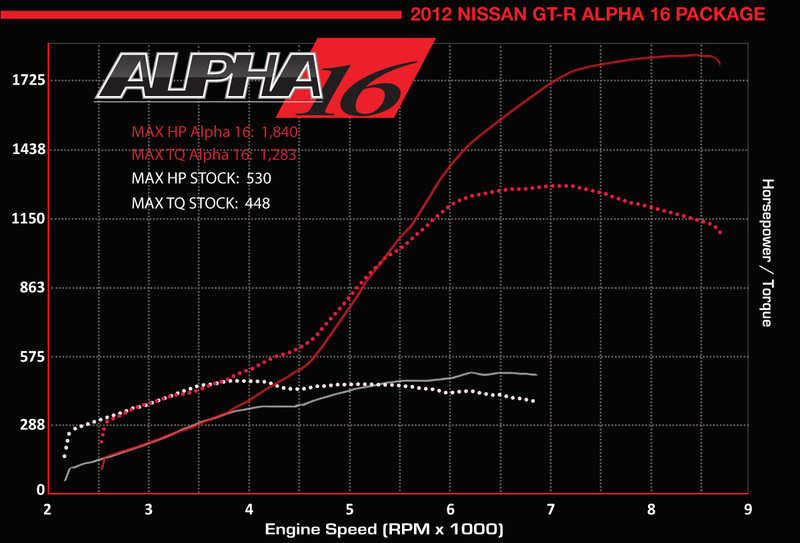 To withstand the unsurpassed power levels from the Alpha 16, the GTR requires advanced engine programming. The Alpha 16 borrows the same race-proven power plant that AMS runs in the worlds quickest and fastest Nissan GT-R-The Alpha Omega. Your hand built VR38 is sleeved with ductile iron for strength and increased bore size-allowing for a displacement of 4.0 liters. Each engine is fortified with the best internal components available, and then balanced, blueprinted and hand assembled to AMS' strict standards. Ear Alpha Premium Engine has been strategically strengthened to support the monstrous torque and power your GTR will now put out. The Alpha CNC race ported cylinder heads and the Alpha Series Camshafts are perfectly matched to flow at all low, mid and high rpm's giving you the most effective power curve. Necessary components to survive the brutal power of the Alpha 16 are included, with consist of a T1 transmission brace and Drive Shaft Shop Axels to make sure your power makes it to the ground. Bar none, this kit will absolutely destroy anything and everything in its path. When you need to be the fastest car out there (by a long shot) the Alpha 16 performance packages is what you want.